Babies seem happiest when they are provided the best of care to help them feel safe and secure. The best care for the baby is provided when OZ solutions are bundled. OZ Systems is the only company offering solutions for all mandated newborn screenings. In our world, saving the newest lives comes first. OZ solutions improves patient safety by reducing human errors and the time it takes to perform the mandated newborn screenings. OZ NANI™ is the interface between a hospital’s EHR (Electronic Health Record) and OZ software solutions. OZ NANI™ improves quality and reduces risk by providing automated newborn admission demographics and birth information as well as discharge and internal transfer information in real time. As you know, babies should not be discharged unless they have received all the mandated newborn screenings. 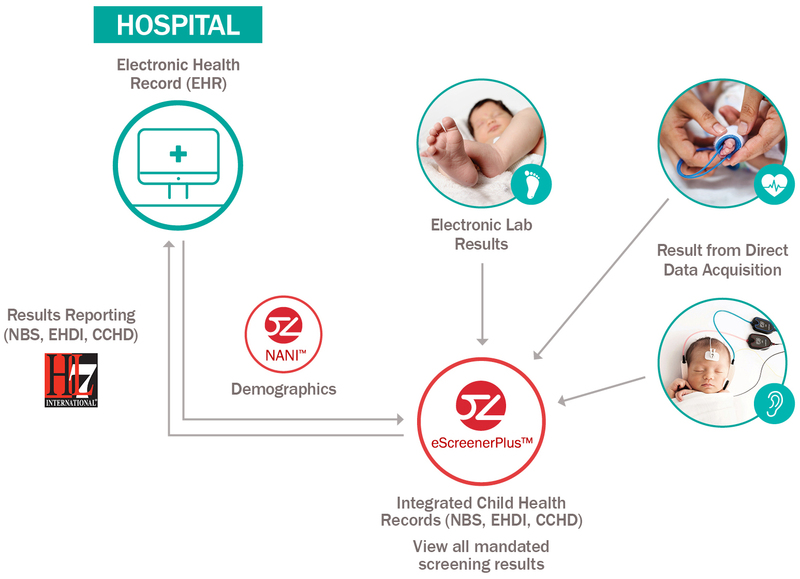 OZ eScreener Plus is a baby-centric solution that allows you to manage all newborn screening data in one integrated child health record. With OZ eScreener Plus you have the ability to store patient demographics, birth information and access results for all mandated screenings. * TelepathyTM EHDI and TelepathyTM CCHD are required for results reporting back into the EHR.